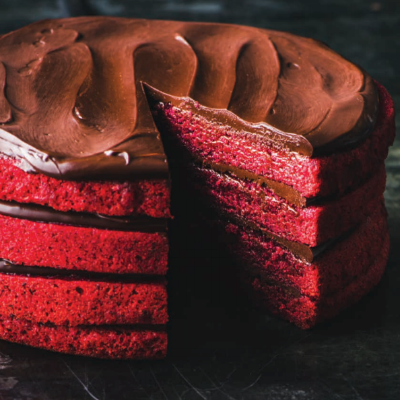 We developed this cake—our version of classic red velvet—to complement the earthy, funky, sometimes grassy flavor profile of our Liberian chocolate. Some of us think it tastes like caramel and cinnamon; others taste iron shavings and a freshly mowed lawn. This chocolate is a customer favorite, and it earned a Good Food Award in 2014, which seems to be how our most polarizing chocolates work. Either way, we like the way the vegetal sweetness of the roasted beets plays off the chocolate, and the striking contrast of vibrant red against the shining, jet-black ganache layers. 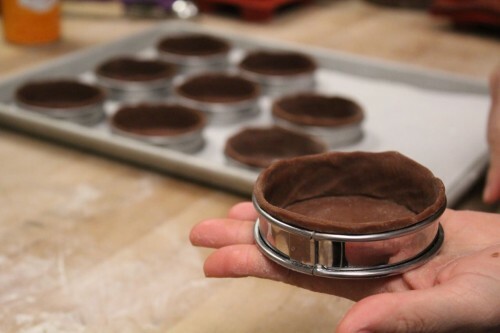 Spray or butter two 8-inch round cake pans, line them with parchment, and grease again. In the bowl of a stand mixer fitted with the whisk attachment, whisk the eggs, sugar, and salt on high speed until the mixture becomes pale in color and falls back on itself in ribbons when the whisk is removed, 4 to 6 minutes. Fold in the beet puree until the batter is streaked with color but not completely incorporated. This will prevent the beaten eggs from deflating too much as you mix the batter. Sift together the cake flour and finely ground chocolate, then fold them into the batter until just combined. Divide the mixture evenly between the prepared cake pans. 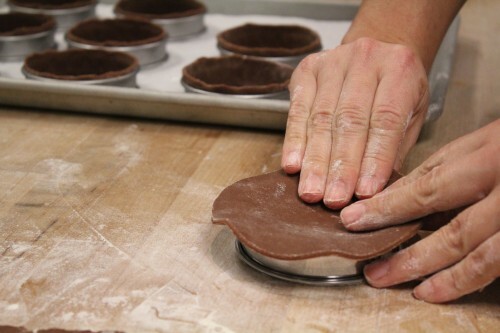 Bake the cakes for 25 to 30 minutes, until a cake tester inserted in the center comes out clean. Allow the cakes to cool completely on a wire rack, and refrigerate or freeze them before slicing the cakes in half horizontally (using a serrated knife) to make 4 cake rounds. Place the chocolate in a large bowl and set aside. Heat the sugar over medium-low heat in a dry heavy-duty saucepan. Watch it carefully—the sugar on the bottom will begin to melt. When you see the edges begin to brown, use a heatproof spatula to drag the sugar toward the center to prevent any burning, and continue to stir occasionally until the sugar is completely melted and has turned a medium amber color. Remove the pan from the heat and immediately start pouring the cream into the caramel in a small, steady stream, while whisking constantly. The caramel will bubble violently and may even seize up slightly, and that’s okay. Continue to whisk, and put the pan back on high heat. As you bring the caramel liquid to a boil, any seized sugar chunks that may remain should dissolve. Once the liquid reaches a rolling boil, immediately pour it over the chocolate. Let the hot cream sit undisturbed on top of the chocolate for 30 seconds. Then use a whisk to stir slowly at first and then more vigorously as the chocolate and cream combine and the mixture thickens. 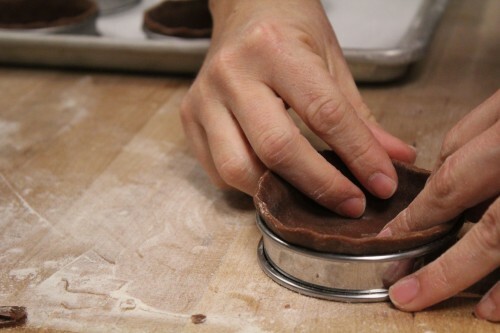 The ganache should appear shiny and thick, but still be liquid enough to pour. Allow the ganache to fully cool and thicken before assembling the cake. Using a large offset spatula, spread a thin layer of ganache evenly on top of each cake layer, and layer one on top of another to create a 4-layer cake. Before cutting it, allow the cake to set in the refrigerator, uncovered, for about an hour. The cake will keep in an airtight container at room temperature for several days, or in the refrigerator for up to 1 week. As I celebrate my four year anniversary (with a giant oatmeal cookie next to me) I wanted to share some of my favorite memories, and what I am excited about for the future! It really does seem like yesterday when I walked into the factory here at 740 Valencia and met the whole team, including Todd, Greg, Cam, Caitlin, Norah, Jennifer and of course Meredyth, my first pastry assistant. At that point in my career, after 12 years working in fine dining kitchens I was looking for something different, even if I didn’t know what that might be. Luckily, Dandelion was looking for something different too. Back then, the factory had just come off a summer of pop-ups; each week, a different chef took over the pastry kitchen. It was exciting and delicious, but hectic. In those days, Dandelion Chocolate was a small, 20-person company (compared to the team of 80+ that we’ve grown into now).The cafe was open five days a week, not seven, and the hours were shorter too. When I got the job, I rolled up my sleeves, and put refrigerators anywhere that had a plug, even a hall closet. 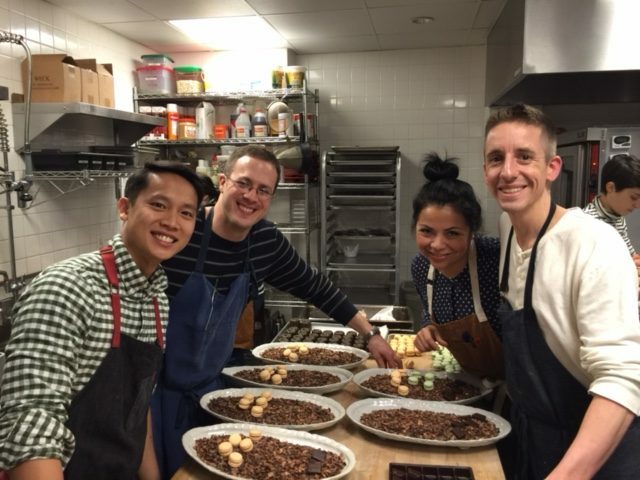 I began to learn the challenges and thrills of working with single origin chocolate, having no cocoa powder in my kitchen (which was unlike any other pastry kitchen I’d worked in, ever), and learning the ins and outs of some tech language (for the first few months, I called our company-wide “all hands” meeting a “hands-on” meeting). Prepping the bostock for our Friday tasting. These were challenges I had never thought I’d have. I really never imagined four years later I would be a co-author of our book, Making Chocolate (which launches November 14th! ), see Dandelion expand to locations in Japan where they make the same original pastries and drinks we worked on very early on, and a kiosk at the Ferry Building. I never thought I’d have traveled to origin in Belize (with a hair dryer and no hiking boots), help organize our annual 12 Nights of Chocolate where we’ve hosted some of the chefs I admire most, (Emily Luchetti, Dominique Crenn, Matt Siciliano and Ramon Perez, just to name a few). And I never imagined I’d have managed the cafe for nine months while still keeping the kitchen running, and last but not least, have a kitchen team of five pastry assistants whom I admire and adore. Working on a book was fun and challenging, and lasted two whole years! Just when I would start to lose momentum during an eight-hour photo shoot with our photographer Eric, somehow working with him was still, always, more than inspiring. His photos gave new life and energy to our hot chocolates and pastries. I never imagined a pile of marshmallows could look so stunning and mesmerizing! Towards project completion, the pressure intensified. Many tears were shed in the bathroom at Souvla next door and the factory became a dark scary blur when a measurement came back to edit or the wrong photo had been inserted. But come November 14th, I am humbled and excited to share what I love doing most. In the book, you’ll learn how to make all of our favorite pastries and drinks, as well as how to make chocolate from scratch, source beans, and basically get a full look at everything we’ve learned about making chocolate and working with cocoa producers. 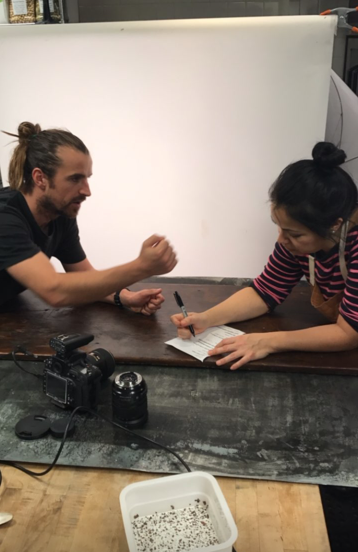 Eric Wolfinger and I, strategizing, probably after 12 hours of shooting. Meredyth and I at Ise. I have traveled to Japan to work with their dedicated and awesome kitchen team and have fallen in love with Japanese culture. The work ethic, the food, the hospitality, everything spoke to me. This past May, I was able to bring Meredyth, who manages our kitchen R&D and it was so special to see the s’more and nibby horchata on the menu in the tiny coastal town of Ise. Ise is about an hour train ride from Kyoto and one of the most famous and sacred places in Japan, it is home to the Ise-jingu shrine which, now, is just a few steps away from the most charming hot chocolate stand. My day always starts checking in with Mary or Roman, who do the weekly 6am bake. I can always tell within seconds how things are flowing. The telltale signs that things are going smoothly or not: If they don’t look up (super focused, good), if Mariah Carey is blasting (then it’s a great morning), if there are no visible coffee cups (everything is good), if they’re talking in accents (always an excellent sign, especially before 8am). Regardless of the early morning vibes, their passion and energy are never wavering. Around 8am, Meredyth comes in to chip away at our long list of R&D ideas, but first usually bakes off biscuits from her stash in the freezer and scopes out the morning bake 2nds that didn’t pass our quality inspection. She researches and tests recipes over and over and then over again until they are perfect, and we as a team, along with Todd, taste her week’s research every Friday. And every Friday Todd admits it’s his favorite meeting of the week. Just last week we tasted eight different varieties of bostock (coming to the cafe soon) with almond or pistachio frangipane with chocolate-soaked brioche, or just chocolate chips baked on top, square sliced and round. Meredyth doesn’t stop testing and tasting until we all decide on the perfect pastry. 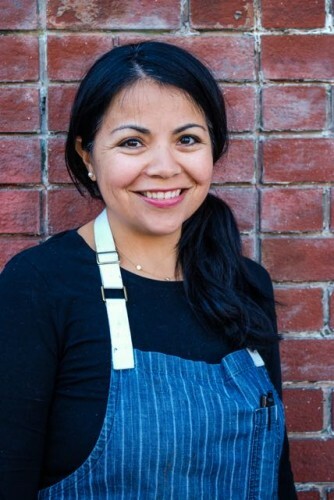 We have worked side by side for the last four years and her love and dedication to our kitchen has contributed to its success and growth. My team is the best team. From left: Roman, Mary, me, and Meredyth. On Saturdays and Sundays, Ellie and Zach—who spend the week prepping drinks, doughs, and endless amounts of marshmallows—work in the kitchen in our Valencia Street factory. If you have ever been in the Valencia cafe on the weekend around 1pm when the line is out the door, the marshmallow bowl is never empty, and you can’t walk a tray of cookies through the crowd, these two are in the back hustling a busy service with precision and stamina. I am so fortunate to work with Meredyth, Mary, Ellie, Roman and Zach; they are five very different individuals with different skills, past experiences and palettes who work thoughtfully and with a sense of humor. Since the day I walked through the door, it has been an adventure and every day gets more exciting. There are new projects, new locations and of course new pastries. I feel like a kid on Christmas Eve waiting for the book to come out (so soon)! We are starting to work on ideas for our upcoming chocolate salon in our upcoming factory on Alabama Street (a pastry dream come true! ), an elevated experience from what our current locations offer. And hopefully, fingers crossed, we will be moved into our beautiful brand new kitchen there soon. 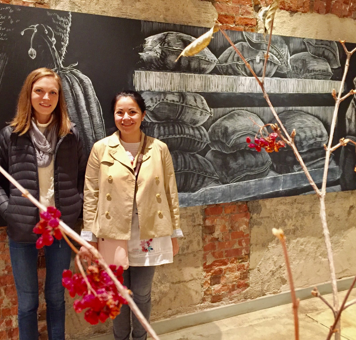 Working here has pushed my creativity, opened my eyes to different parts of the world and has allowed me to be a part of a team that is dedicated to creating the very best chocolate experience. We brainstorm, we taste a lot of pastries, we eat a lot of Tartine bread and butter, we push each other and we genuinely love our work and I love being a part of this team. I love figs. 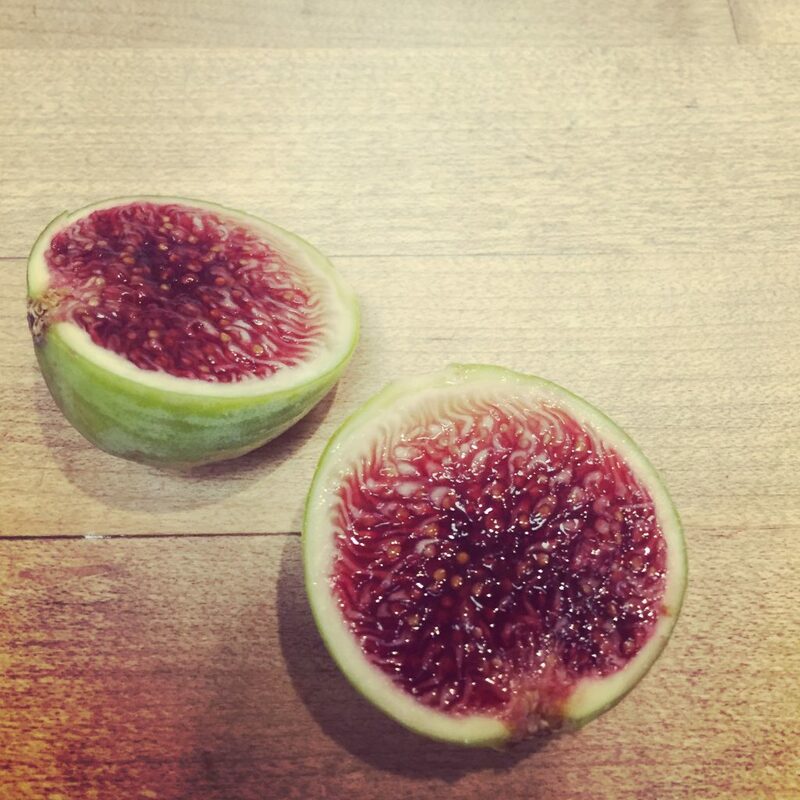 When I was growing up in my mother’s house, we had a Black Mission fig tree in the backyard that produced the most delicious, plump little figs in the summertime. I especially love how they pair with chocolate—that syrupy sweetness with a tart edge on top of a classic, chocolatey chocolate. When figs came into season this year, I knew I wanted to do something with them. 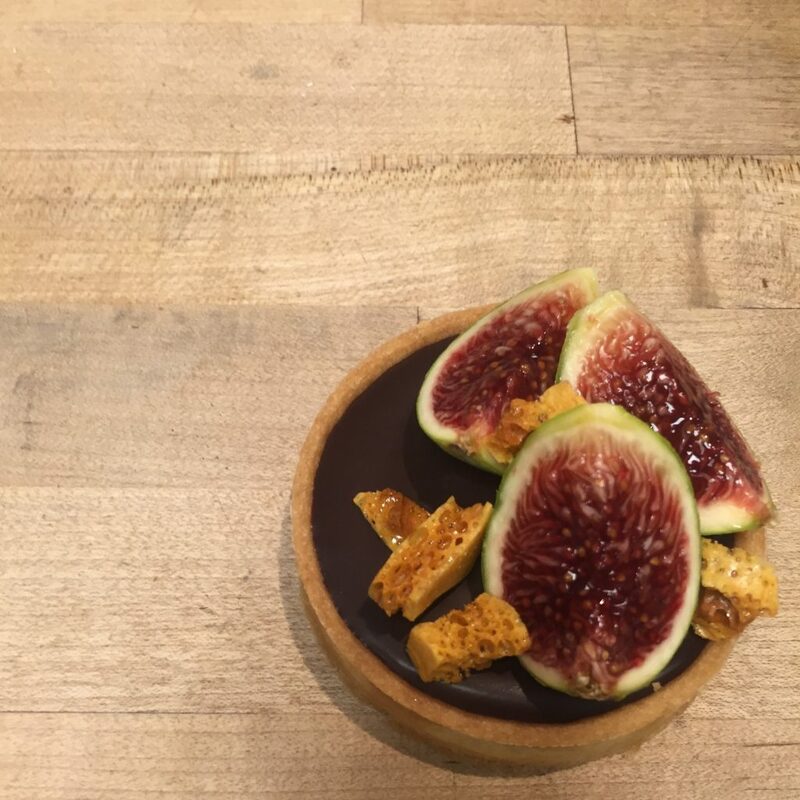 To start, we grabbed a few Adriatic figs, which are a little rounder, greener, and sweeter than most (at least to me they are), some classic Black Mission figs, and opened our pantry door to see what we could make. A tart is a perfect way to layer flavors and textures, and it offers a million ways to build dimension into your dessert. 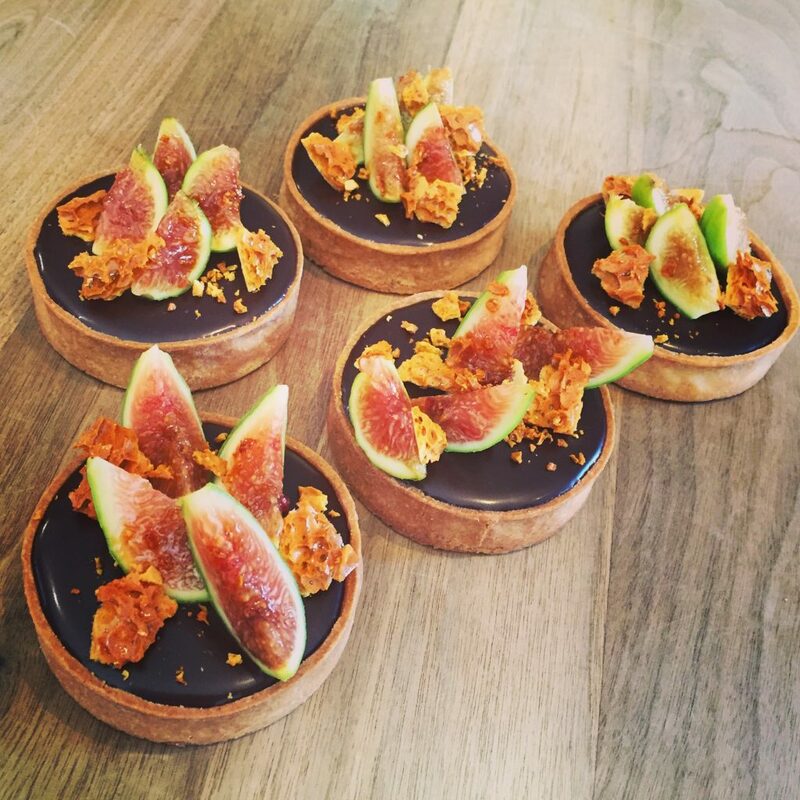 We started our R&D with a honey ganache in an almond sable crust, topped with sliced figs. It was delicious, sure, but a little too plain. To cut through those soft, sweet layers, we added a bit of goat cheese mascarpone on the bottom. Now, all it needed is a little texture: honeycomb! We boiled up some honey, sugar, and water, whisked in the baking soda and let it set into a flaky, crunchy honeycomb that melts on your tongue. Like all good things, fig season won’t last forever. If I had to guess, I’d say we’ve got two more good weeks left until the figs are gone and the pumpkins are here. So drop in soon and get one while they last! 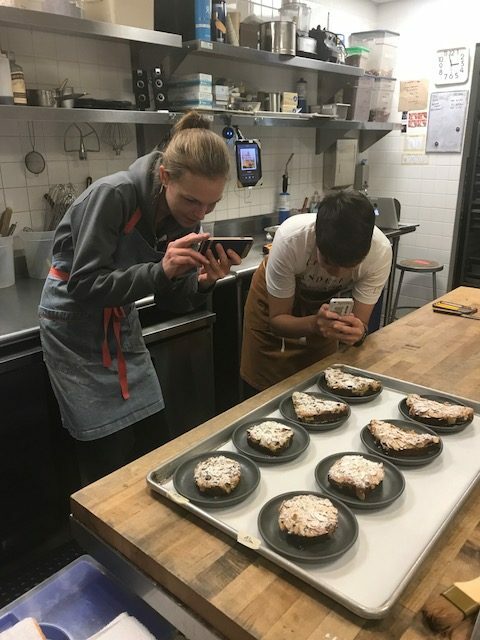 For the past few weeks, Executive Pastry Chef Lisa Vega and our pastry team have been busy developing three new recipes to coincide with the opening of our Ferry Building brick-and-mortar space. Below, she recounts just how it all came together. 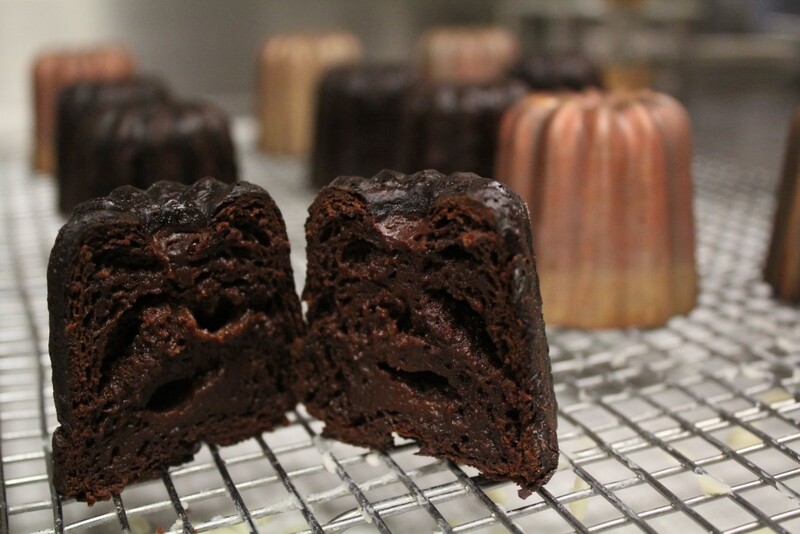 A canelé is a beautiful thing, but as any home cook or pastry chef knows, they’re so hard to make well. 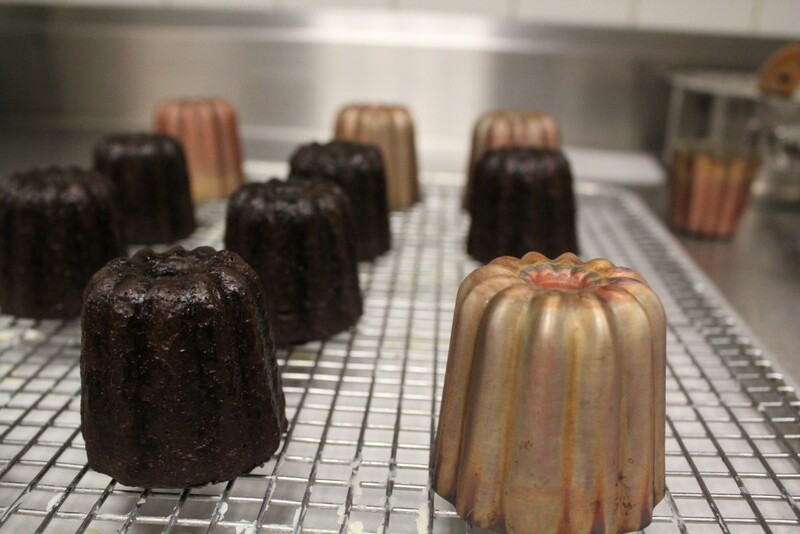 I’ve always thought that if everyone in my kitchen can bake a perfect canelé, that means we have the skills to do just about anything. To kick us off on recipe development, I sent Meredyth, Lucy, Lia, and Mary this essay by Paula Wolfert about the history and closely-guarded secrets of the canelé; the recipe is filled with places to trip up: seasoning the copper molds with a perfectly even, paper-thin coat of butter and beeswax in a way that doesn’t leave puddles or holes in the crust of the pastry, flipping them out of the molds while still hot, baking them them to the perfect threshold that crisps the crust but doesn’t over-bake the custard inside. The cakes themselves are fluted and small enough to hold in your palm, and the hallmark of a good one is the shining, crackling, nearly blackened crust of caramelized sugar around a pillowy soft baked custard inside. A classic canelé is vanilla, but we’re not traditionalists in this kitchen. Ours, of course, is chocolate. Deep, dark chocolate. 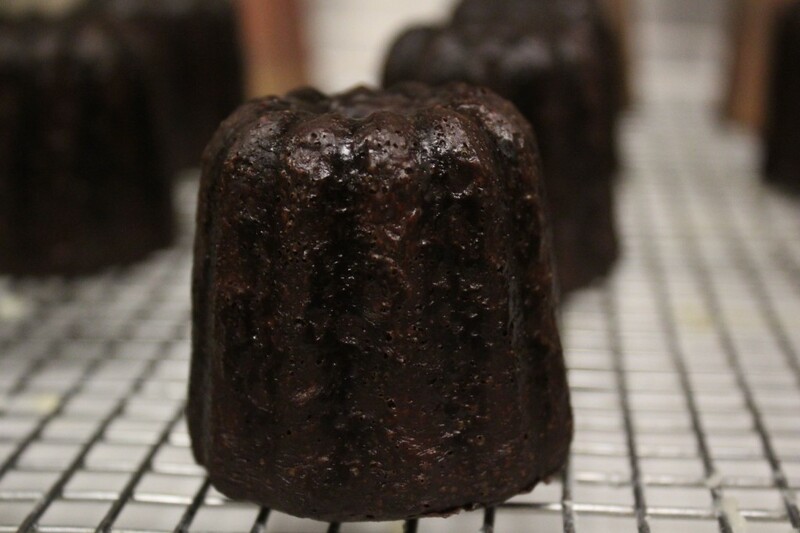 It took two weeks of constant recipe testing, but we’ve finally nailed it, and though the bakers in Bordeaux 300 years ago would slap my wrist for saying it, I think chocolate is a canelé’s best friend. Next, we decided to work on something more seasonal: a chocolate passionfruit tart. Meredyth calls these “Drake tarts” because we usually blast Drake over the Jambox when we make them—a good soundtrack to dozens of recipe iterations and shortbread dough that won’t stop cracking when you tuck it into the mold. In the end, we ended up with a rum -and-coconut caramel, a ganache with passionfruit purée and Camino Verde chocolate topped with toasted meringue and coconut, all inside a buttery, chocolate shortbread crust. And for our final, salty finale, we tried something we’ve never tried before: a savory pastry. I’ve always wanted to include something savory, so we got to work on what I think is a wonderful new counterpart to our most chocolatey chocolate: pancetta. We use pancetta from The Fatted Calf—not too salty—which works quite nicely with the nibs and buttery richness of our nibby scone. We also peppered in a few Deglet Noor dates (Medjools were too sweet and mushy) for a little more earthy sweetness, and behold: the Pancetta Scone. Enjoy! 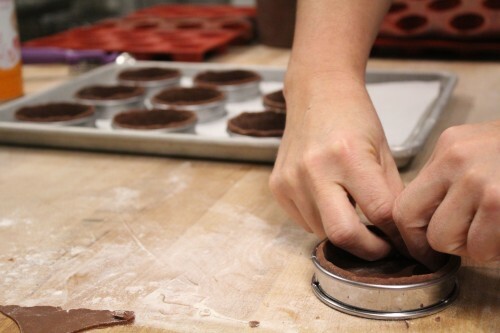 Today, I’m celebrating my two-year anniversary as the Executive Pastry Chef at Dandelion Chocolate! I never imagined that a quick, introductory meeting with Todd while en route to the Jay Z and Justin Timberlake concert (while gainfully employed) could change my career path. 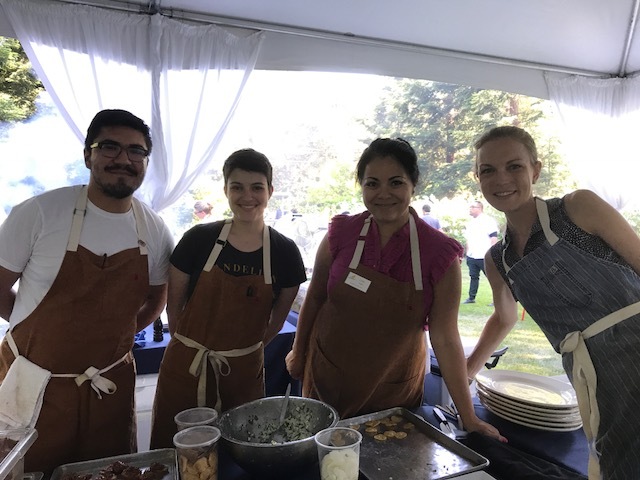 I was deep into the throes of restaurant life: long grueling days, dinner out of plastic quart containers, two obligatory post-dinner-service tequila gimlets, and blistered fingers from quenelling ice cream for six straight hours every night. I thought that was just the norm. At first, the cultural difference was a shock. WordPress, All Hands (our monthly company-wide meeting) and weekly “one-on-one” meetings were all foreign terms to me. A “one-on-one” in restaurant culture meant you were ordering a shot of Jameson with a beer chaser. Speaking in the common/pirate-esque kitchen terminology I was accustomed to was like speaking a different language here. However, over time, I have settled in to what has been the best adventure in the most supportive environment (I often receive applause for putting brownie scraps on the factory staircase). I am fortunate to have the creative responsibility along with my kitchen team to take this delicious ingredient and make it into unique drinks and pastries while also teaching our customers about the charm of single origin chocolate. I have consumed chocolate every day for the last two years, and some of my personal favorites (my “Camino Verde greatest hits”) are the nibby horchata, frozen hot chocolate, and dulce de leche bar. I can’t wait for all that the future has in store: the Ferry Building hot chocolate and pastry stand, and a book that will include our kitchen recipes. Until then, I’ll be holding down the kitchen in our continually bustling cafe on Valencia Street, where I end my work week on Saturdays around 5pm when there is always still a line out the door for chocolate! *This letter also appeared in our September newsletter. To sign up for monthly updates, visit our Contact Us page.